Passengers at Heathrow Airport faced delays and cancellations following a "technical issue" affecting the runway lights. There were delays to one in seven flights due to land at Heathrow between 6:00 GMT and 8:59, according to aviation data firm FlightStats. One flight from the United States was delayed for more than three hours. 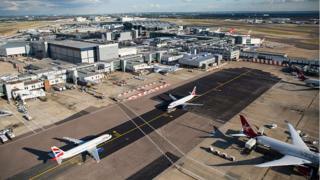 Heathrow said the problem was fixed but advised travellers to check with their airline before coming to the airport. British Airways initially warned it was diverting some flights. It now says contingency plans have been activated and it expects to operate a full schedule but with some delays. Earlier, passengers due to fly into Heathrow reported they had not been allowed to take off. The longest delay was to a United Airlines flight from Newark in New Jersey which was more than three hours behind schedule. An airport statement posted on Heathrow's website said: "Following an earlier technical issue with the lighting system for the runways, contingency plans have been activated and both runways are currently open and fully operational. "There have been no cancellations as a result and we are expecting to run today's full schedule. "We apologise for any disruption to your journey." A spokeswoman for British Airways said: "We're asking customers that are due to travel with us today to continue to monitor ba.com for any updates to their flight."